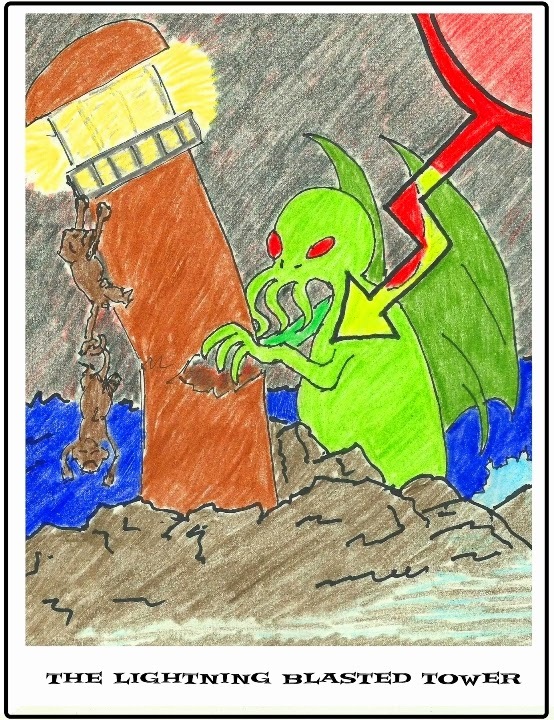 Rough draft of the Tower card for the Monkey Tarot. 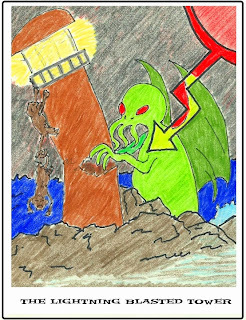 The fact that I know so little about classical mythology is probably best illustrated by my rough draft for the Lightning Blasted Tower card for the Monkey Tarot...or is it a rough draft for a Mythos Gang Tarot?...maybe a little of both at this stage. I can't tell you the classical mythology that underlies the Tower card. I know that in Golden Dawn, the Tower is associated with Mars--but that is modern mythology. In fact, most of the mythology that I know is modern mythology. And I am not sure that I am alone in being ignorant of classical mythology. I know that the class that I was in community college that read the Iliad and Paradise Lost seems blissfully ignorant of classical mythology for the most part (there were maybe three people in the class, other than the professor that is, who seemed to have a passing acquaintance with the subject). When I was growing up, I know that I wasn't exposed to a lot of classical mythology. Since then, I have studied mythology on my own...but I still cannot tell you how it might connect to the Tower card. Furthermore, the mythologies that I have read the most about are not the classical mythologies that informs Western civilization. Our heritage is Greek and Roman mythology for the most part, plus the Biblical mythology, not the Norse and Ancient Egyptian mythologies that I am fond of. Now, that does not mean that I am cut off from being to talk about the Tower card in terms of mythology...but the stories I use are really modern stories. Such as Ghostbusters, Back to the Future, and the Cthulhu mythos. Maybe a little Star Wars to boot. I am not sure if any of those stories can be considered mythology, but they would be the stories that I would use to describe this card to someone who was unfamiliar with it. And I am willing to bet that more people are familiar with those stories than the mythic tales from Ancient Greece and the Roman Empire about Zeus and Ares (Jupiter and Mars). Modern stories are absolutely valid mythology. What they all have in common is the interaction of the archetypes. Christopher Lloyd's Professor is another face of Obi Wan Kanobi which is another face of the Hermit or the Heirophant. For classical mythology I have really enjoyed Robert Graves' Greek Myth. Cool, and you have a great point - a lot of people these days would connect to modern "myths" much quicker than the ancient ones.. Yes Yes Yes! Our modern stories follow the same archetypes as ancient classic myths, and the same as tarot. It's all the same journey told in different ways for different times. I really liked that you pointed out the modern myths. Well done! A definite yes from me in using modern stories! I often mix Cinderella with the spirituality of Babylon 5 if it makes a point. Great post and artwork! Don't know much about Babylon 5 but Battlestar Galactica draws on so many different mythologies I've lost count :-) Great post, thanks! Ghostbusters and Star Wars are very much mythology! Thanks for the great post. An excellent reminder, Morgan, of the persistence of our mythical archetypes, and your commenters have done a great job of adding to the spectrum and pointing out the connections. BTW, your Norse gods are quite similar in function and personality to the Greco-Roman pantheon, so you know more than you think you do. All of them, and the Hindu pantheon come from the same Indo-European roots in central Asia. Do I really need to say that I am not a Nazi? !